To facilitate discussion, these views of human nature must be labeled. The terms should be apolitical, they should be familiar so that citizens can easily grasp them, and they should reflect the view of human nature that each label represents. To insure that we achieve the goals of neutrality and comprehensibility, the term "Spring-Gravity Theory" was coined to represent the two views of human nature. 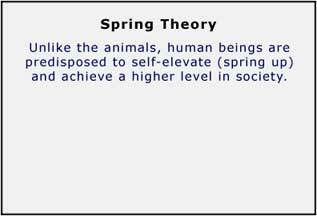 The term "Spring-Gravity Theory" was originated by Don Magyar and first applied in his book The Essence of Man (Volume 1 of the Humanology® series). The accepted view of human nature will henceforth be referred to as Spring Theory. The term Spring Theory represents the spring-like characteristic of human nature that supposedly is forever pushing us upward. The new view of human nature will henceforth be referred to as Gravity Theory. 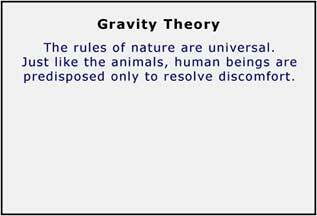 The term Gravity Theory implies that human beings are predisposed to seek their lowest level (much like the way gravity affects water). Specifically, human beings choose the course of action that promises the least amount of discomfort and they always follow the path of least resistance (just as does water). Spring Gravity Theory® and Humanology® are registered trademarks of Don Magyar.